Yin Tao stars as Yang Guifei, one of the four beauties of ancient China, in a new epic drama, Secret Anecdotes of Yang Guifei. Chinese actress Yin Tao, who has played the lead role in 24 TV dramas since 2003, is now working her magic on audiences overseas. Her latest work, Pleiades in a Blue Sky, is the first TV production from China to be screened on Japan's NHK at prime time. Adapted from a novel, it has higher ratings than other popular Japanese dramas being shown at the same time. Yin has so impressed viewers with her refined performance that they have dubbed her "Chinese Aurora". Yin plays Mrs Zhang, niece of the Empress Dowager Ci Xi of the Qing Dynasty (1644-1911), who disguises herself as a bar hostess and mingles with ordinary folk, to report back to the ruler. Yin's performance has won her high viewer ratings but "I really don't think I am that excellent", says the actress. "The dramas are popular mostly because the plots are interesting. I am just the lucky one who gets to present these good stories to the audience." Born in Chongqing municipality, famous for its spicy hot pot, Yin says she has the typical Chongqing temperament - simple and straightforward. Indeed, Yin frankly tells fans her date of birth, her student days and flaws in her performances. "Maybe my looks are my asset. People always tell me I have expressive eyes," Yin says. Her best known role is that of an army girl in The Sky of History, a TV series on army life. It was after this that her career took off. She then starred in a number of TV series with a similar theme, including Vertical Strike, Stories of a Medical Team and Happiness is Like Flowers, which were shown on major TV channels such as CCTV 1 and won Feitian Awards, dubbed the Chinese Emmys. A one-time student of the PLA School of Arts, Yin says the "military training helped me to understand characters in the plots, but I still had to show their ordinary sides. They are tough at first glance, but deep inside they are gentle and full of complex emotions." Yin says she believes each of the characters she has played resembles her in some way. A straight A student in school, her career as an actress seems to be going the same way. She is quick to point out that she really is adventurous. "I seldom think much about what kind of TV dramas and characters I want to do." Yin remembers her father constantly drilling into her an old Chinese proverb, "More haste, less speed", throughout her childhood. It basically means there is no quick route to success. The actress believes in focusing on what's at hand rather than speculating about the future. 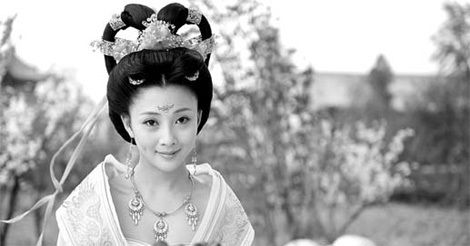 Yin has just finished work on another epic drama, Secret Anecdotes of Yang Guifei, on the life of Emperor Xuanzong of the Tang Dynasty (AD 618-907) and his consort Yang Guifei, one of the four beauties of ancient China. "I have never been in such a feminine role and it is hard to capture Yang's sweetness and charm." Although Yin considers the role a challenge, she hopes her new look will be a breakthrough. She is now busy preparing a sitcom for CCTV's Spring Festival Gala, on the life of China's first batch of women jet fighter pilots.